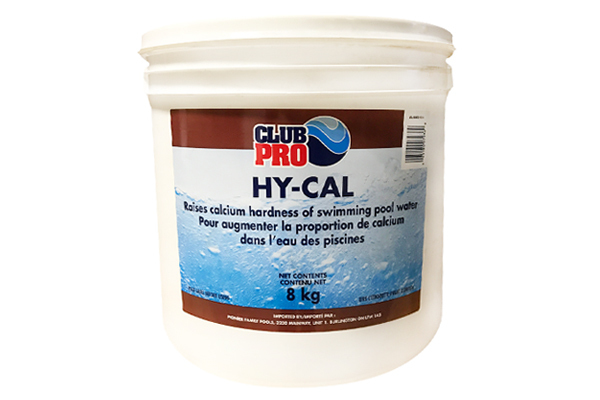 Hy-Cal Is The Ultimate Pool Calcium Increaser! Pool Calcium increaser, Hy-Cal, is used to increase the level of calcium in your swimming pool water. Calcium, is the measurement of the amount of calcium or magnesium present in your pool water. It affects the efficiency of your chlorine and can adversely affect the general cost of maintaining your pool. It is read in ppm and has an optimum range between 200 and 300 ppm. Pools with a plaster finish should be especially aware of this parameter, as a low reading can cause etching in the finish. As well, if your reading is low, it can also pit metal surfaces. If it is too high, it will have a tendency to form scale deposits on the surface of the pool, decrease circulation and increase heating and chlorine costs. Low calcium levels can also cause wrinkles in your vinyl liner. If Your Calcium Hardness level is too low, itt can be raised by adding hydrated calcium chloride, marketed as Hy-Cal, directly to the pool water. Pre-dissolve the product in a plastic pail of cold water before adding to the pool. You can use your pool immediately after applying Hy-Cal. If Your Calcium Hardness level Is too high, the only convenient method of lowering it is to replace a portion of your pool water. Please read all labels before adding any chemical to your pool, follow all safety instructions and consult a pool professional if you have any questions.